Most lash techs (or fans of having the treatment) are aware of the term ‘classic’ lash extensions. Simply put it involves the application of one false lash to one natural lash that has been isolated with tweezers and precisely applied. This technique gives longer, fuller but well defined eyelashes. This is the ideal application technique for those who want a natural looking enhancement. Typically application takes 60-90 minutes. Lashes tend to be a little thicker than that used for Volume Lashes to ensure additional volume and definition is given with each individual lash applied (typically 0.10 – 0.20mm thicknesses). 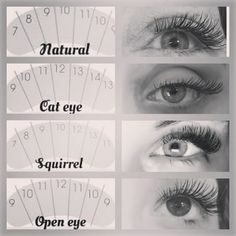 Lashes are usually tailored in length to reflect the natural lash lengths working from shortest to the inner eye corner out to longer to the outer eye corner dependent on the look desired. Infills are typically required every 2-3 weeks as lost lashes (from natural lash shedding) can be quite obvious due to the lashes being thicker. Also lashes require removal and reapplication more regularly then with volume lashes as, as the natural lash grows this leaves a gap between the lash line and where the false lash joins which becomes quite noticeable within 10-21 days. This style of lashes has grown hugely in popularity over the last 12 months as the technology involved in manufacturing synthetic false lashes has developed. Most lash techs now offer this application technique to create the big, fluffy, voluminous lashes seen on celebrities. A fan is created from 2-6 individual false lashes and applied to one isolated natural lash. Due to the number of lashes being applied, the individual thickness of each false lash tends to be thinner and lighter than that used for classic lashes (typically 0.05-0.07mm each). These are often referred to as mink lashes due to their soft, finer appearance. This technique uses less glue, the lashes are more comfortable to wear and require less frequent infill treatments (typically every 3-5 weeks). Their application can be adapted to create a range of different volume looks to enhance most eye shapes from a cat look to the popular ‘squirrel’ look giving full-on volume. 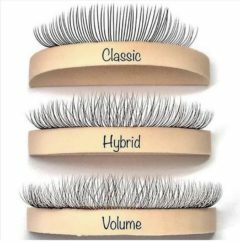 Hybrid lashes, driven by celebrities such as the Kardashians who seek a combination of the definition provided by classic lashes with the volume of Russian Lashes, have risen hugely in popularity. Hybrid lashes is the biggest buzz word in the lash tech world right now. This technique has been moved forward by creative lash techs looking to adapt the way they work to better meet the needs of clients. Hybrid lashes represent the best of both worlds with a more natural, ‘messier’ look achieved that is less uniform more like how natural lashes grow. Achieved by applying a 50/50 mix of 1 to 1 classic lashes and hand-made fanned, volume lashes (NOT pre-made fan or cluster lashes with the bulbs which can be bad for natural lashes). These are applied so that a classic lash is used either side to sandwich around one to two volume fans, repeated over and over until 60-90% of all natural lashes are extended (dependent on look required). They are versatile in offering a thicker, denser look than classic lashes, but without the uniformity and softness of a typical Russian volume set. Great also for staggering longer and shorter lashes for a more natural look or as a way of trying out the volume look for those classic lash clients who are unsure about a denser look initially. They are great for anyone with naturally fine or slightly gappy lashes, whereby volume fans can be placed in sparser areas to make the lash line look fuller. Typically taking around 2-2.5 hours for a full set, this technique is more time consuming and essentially a work of creative lash art. The lash tech selects thicknesses, lengths and curls to suit the client’s natural lashes and look desired but you could achieve a very staggered, spiky looking hybrid set, or you could have a shorter, more natural looking wispy set with less graduation in lengths. 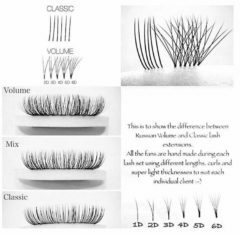 Thicknesses of lashes will still fit with that as you would if working to apply just classics (usually 0.10-0.20mm) and for the volume fans (usually 0.05-0.10mm depending on whether 2D or up to 6D), taking consideration of the condition and strength of their natural lashes to support the lash extensions. So to recap, there is no different technique as such for hybrid lashes. You isolate the natural lash, apply the individual or fan of individuals in the exact same way using the same tools and products. Therefore you do not necessarily require any specific training beyond the classic and volume techniques. It is simply combining the classic lash and volume lash techniques to best effect to meet the needs of your clients and just having some fun with it, trying out different looks mixing the two techniques for a unique effect. One slight note, it is important to check with your insurance provider regarding their stance on covering you for ‘hybrid’ lashes to ensure they will recognise your training in individual and volume lashes to cover you to combine these techniques as there is still some confusion in the industry even among professionals over this ‘new’ approach to eyelash extension application which hopefully with time will become clearer to both lash techs, clients and insurance providers. For those who wish to learn more, we will be launching a new online course covering best practice on this technique coming very soon! Keep an eye on our website & social media for more details as announced. Images courtesy of Pinterest.